You know someone's in for a world of hurt when those things pop out. lol... dat face! "I'm gonna murder your family!" Wolverine is awesome! He was so badass in Days of Future Past! Just like "I gonna tear you in half!!!" Just what I needed! Can you please help my group by joining it here: comicbookgang.deviantart.com you art is the best!! One of the coolest superheroes ever!!! Very unique! 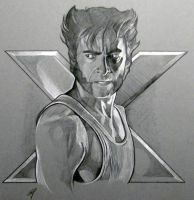 Just posted a wolverine pic myself. I am Wolverine, hear me ROAR! the details are awesome specially the teeth! I agreed Wolverine is BADASS!!!!! Such a phenomenal amount of detail and emotion on the picture. LURV IT. 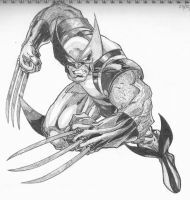 I think this is my new favorite illustration of Wolverine! I love the rage in his face, it's simply beautiful. dude this is so hot! that is so awesome I want it in my room! Jesus Christ! This is beautiful! In an ideal world, Logan would be be my bestfriend! just wow!!! i wish i was half as good!